Rose McClelland - Author : A Day in the Life ... of a Publisher! A Day in the Life ... of a Publisher! To start off my "Day in the Life" series, I'm lucky enough to follow Editor and Publisher - Crooked Cat! Mister Cat, can you tell me what happened on the day you decided to set up your own publishing company? Was it a sudden "Aha! This is what I want to do" moment, or was it a long process where you had been mulling over the idea for months? You know, the life of a cat can be very tiring. One moment you're sitting by the fire, taking in forty winks, dreaming of that next delicious piece of salmon, waiting for Christmas. And the next you're in charge of a brilliantly original publishing company. I could barely get my paws under the desk before people were asking me to read this, and publish that. My owner wrote a story a few years ago, you see, and she saw it accepted and published by one of the better known companies on the circuit. She had completed her second novel when the thought occurred to her to bypass the middle man, and use the experience she had gained in writing and editing, to begin her own publishing company. With yours truly as Managing Director, no less. How lucky for them. But then I always knew I was a natural born leader. I have finesse, you see. Things started to fall into place quite quickly which, of course, I knew they would. But even I didn't realise that we would be as big and popular as we are. We have over twenty authors, and more around the corner. The life of a cat can be very tiring indeed. Which is why I let my owner get on with things. Whilst I dream of salmon, and Christmas. How did you find your first writer? Was it an exciting (or scary!) moment when they signed their publishing contract? Of course it was exciting! I found out later on that I very nearly woke up when my owner told me the author T A Belshaw had signed to us, at the end of 2011. I don't recall the exact circumstance - whether we found him, or whether he found us. But I'm sure that there was catnip involved. And perhaps some fish. You started off as an e-publisher. Then recently you were able to provide a paperback option via print on demand / Amazon. Did you start off hoping to publish on paperback or how did this development come about? Isn't paper lovely? I use paper for many different things, preferably scrunched into a ball, although seldom for reading from. I'm told that ePublishing is seen as a step down by many people - that reading an eBook is rather akin to eating the supermarket's own catfood, rather than spending a bit more and taking sustenance from an expensive brand. What nonsense! My owners would tell you that many of the best and most original stories are published as ebooks, by ePublishers, because they recognise good quality when they see it first. And they want people to be able to read it straight away, without having to wait for that scary postman. But some postmen aren't scary and, with that in mind, some of our lovely eBooks are available for you to read on paper, in the toilet. Or wherever you may personally choose to read them. I promise that we will continue to produce more paperbacks for more of you to read. 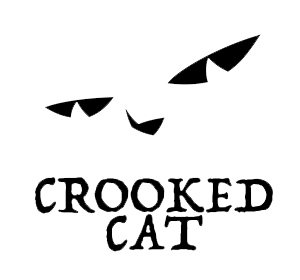 As well as buying Crooked Cat books on Amazon, readers can now purchase books via the Crooked Cat online bookstore. Can you tell us how this came about and what benefits readers can expect from using the specialized store? YAAAAAWWWWWNNN. Pardon? Oh. I suppose so. Mr and Mrs Amazon are lovely, but they can sometimes be a bit big and a bit scary. At least to me. But they don't mean to be. So, whilst I was having a snooze one day, my owner made a bookstore for lovely people to buy our eBooks from. It has a cozy, local bookshop sort of feel to it, the smell of coffee, and with nice big cushions - all that stuff. And when you buy something from the store you get a little personal 'thank you' email from me. And you get lots of points that you can use to buy something else in the store. And you get to make our authors really happy and smiley, as they don't have to share with a third party. 'Cause no-one likes a sad author. And, well basically, who doesn't like a cozy, local bookstore? So much going on in such a short space of time! Did you expect things to spiral so quickly? Spiral? I'm a cat, of course not. It has been very quick, though, and I'm beginning to miss out on naps. So what's it like in the day of publisher/ editor? Talk us through a typical day! I wake up. I eat. I go...you know. I go back to sleep. And sometimes I read things that people have sent in, respond to them, or I mull over a story. Editing is a slow process - the purrfect speed for me. I'm also good with pictures - the darker the better. And then I'll tap away at my little keyboard (actually my owner does, but don't tell her) and do emails and promote our kitties. But mostly I'll just sleep. When reading submissions, is there anything in particular you are looking for? Any advice for budding writers as to how to hone their submission? Include fish, ideally. If not, then some little biscuits work. If you don't have any of those (and, frankly, who doesn't?!? ), then prepare to dazzle me with your talent. Like, spell your worms right, and make sure that your sentence sense make. Does it? Get someone who isn't a blood relation to read it - and get them to say it is brilliant. Be original. You know, normal stuff. Are there any particular genres you are looking for at the moment? Dark things. Spooky things. Murdery things like a cornered mouse…but also fluffy, light things. Depends on my mood. I'm a cat. That doesn't mean I'll like it, though, you understand. 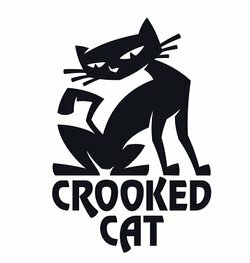 They don't call me 'crooked' for nothing. What has been the most challenging aspect to date? Waking up early. In fact, just waking up. I'm happy in the knowledge that writers find a home with me, and that their lovely stories are being read by lots of lovely strangers across the globe. Lastly, tell us a little about the 'Fear' anthology and your decision to donate all proceeds to charity? Oh. Made of harder stuff, are you? Well, what about my FEAR Anthology, which comes out on October 3rd? I've gathered together sixty of the best indie writers from across the world (this one) and forced them to sit in a room together to write a story each. Then I forced two bestselling international authors (I'm not telling you who), Sherri Browning Erwin and Peter James (grr! ), to write the forewords, and then I said that we would give all the royalties from it to two charities - Barnardo's and Medicines sans Frontieres. And they all believed me! And then I told them that, for more information, they should take themselves off to http://www.facebook.com/fearanthology - and they did. Lurve this guy. So funny! Please tell him I have fish on my blog. Am floating the idea of setting up a publishing company with my cats. We are inspired. What an adorable cat! And so clever, too. Lovely to know more about him! Publishers have a great task in their hands as they want their readers to enjoy their stories and ideas.Also it would give them a well renowned popularity. Your efforts for writing this amazing post are impressive. Keep it up!